Kaoliang, Gaoliangjiu or sorghum wine is a strong distilled liquor of Chinese origin made from fermented sorghum. It is a type of unflavoured baijiu. The liquor originates from Dazhigu (大直沽, located east of Tianjin), first appearing in the Ming Dynasty. It is now primarily made and sold in mainland China and Taiwan and also popular in Korea, where it is called goryangju (hangul: 고량주; hanja: 高粱酒) or bbaegal (which is originated from Chinese character 白干). Kaoliang is an important product of the islands Kinmen and Matsu which are part of Taiwan. Kaoliang ranges between 38 and 63 percent alcohol by volume. Kinmen Kaoliang Liquor (Chinese: 金門高粱酒; pinyin: Jīnmén Gāoliáng Jiǔ) is one of the most popular brands of kaoliang in Republic of China. As its name indicates, it is produced on the island of Kinmen. 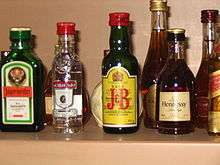 The mainstays of the range are the standard 58 percent and 38 percent alcohol bottlings. Yusan Kaoliang Chiew (Chinese: 玉山高粱酒; pinyin: Yùshān Gāoliáng Jiǔ) is produced by the Taiwan Tobacco and Liquor Corporation. It is named after the highest mountain in Taiwan, Yushan. One of the most notable products in the range is an "X.O." kaoliang aged for five years in tanks before bottling. Tunnel 88 Kaoliang Liquor (Chinese: 八八坑道高粱酒; pinyin: Bā Bā Kēngdào Gāoliáng Jiǔ) is produced by the Matsu Distillery on the island of Nankan, part of the Matsu archipelago. The name is derived from the name of an abandoned military tunnel which the distillery took over as storage space for their kaoliang and aged rice wine. All of the distillery's aged kaoliangs are stored in the tunnel for at least five years. The 1987 Zhang Yimou film Red Sorghum (紅高粱; Pinyin: Hóng Gāoliáng) is set in a rural kaoliang distillery in the Shandong province of China. The fictional character Li Kao, from Barry Hughart's award-winning novels Bridge of Birds, The Story of the Stone, and Eight Skilled Gentlemen, is named after kaoliang; his mother died in childbirth while requesting a last drink, and the abbot attending the birth mistook the syllables "Kao...li...kao..." as her intended name for the child. In Bridge of Birds, while telling the story of his birth, Li Kao describes kaoliang as "the finest paint thinner and worst wine ever invented." Kaoliang is an important catalyst of the action in the story "New Year's Eve" in Taiwanese writer Bai Xianyong's short story collection Taipei People. ↑ Korean Goryangju is produced in both North and South Korea, but Koreans also consume Chinese-produced and Taiwanese-produced kaoliang.